The suspect in the horrific crash in Times Square was high on drugs and had a history of mental illness, sources said. Jonathan Dienst reports. Police are considering the possibility that Thursday's deadly crash in Times Square was a deliberate act after the driver told police he smoked drugs and heard voices telling him to hurt people before the chaos unfolded, law enforcement sources said. An 18-year-old woman was killed and 22 people were injured when 26-year-old Richard Rojas turned the wrong way onto Seventh Avenue in the heart of Times Square and sped along the sidewalk for three-and-a-half blocks, police said. 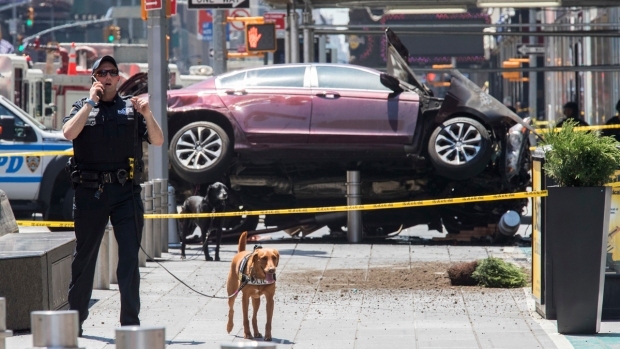 Police say a horrific crash in Times Square left victims scattered all over Seventh Avenue. Ray Villeda reports. Authorities don't believe the crash was terror-related, but investigators aren't ruling out that it was deliberate, sources said. 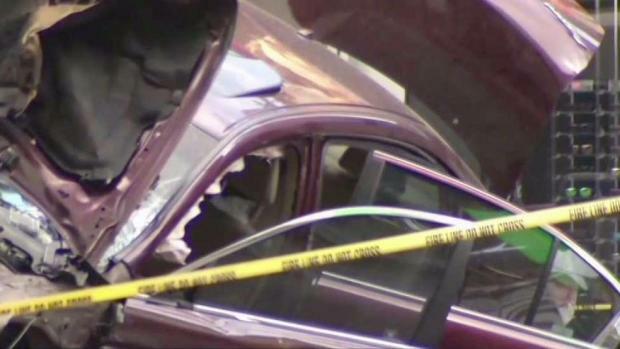 A man driving a car drove his on a sidewalk in Times Square, injuring at least 22 people and killing one, police say. Checkey Beckford reports. As Rojas was being arrested, police said he was acting out of control and seemed impaired. He told police he heard demons in his head and voices telling him to hurt people, sources said, adding he has a history of psychiatric problems. Sources said certain statements and tests suggest Rojas was under the influence of a drug he ingested through smoking. They said he blew a 0.0 when tested for alcohol at the precinct he was brought to for questioning. Police charged Rojas with a slew of charges, including second-degree murder, 20 counts of second-degree attempted murder and five counts of aggravated vehicular homicide, authorities said. Dramatic scenes of an arrest emerged Thursday after a man drove a car into pedestrians in Times Square, killing a young woman. Andrew Siff reports. Former NYPD Commissioner William Bratton said police will do a roll-back investigation, looking at his computers and cell phones, and talking with neighbors and friends. "Was there something else going on? Was this in fact intentional?" Bratton said. The 26-year-old man suspected of crashing into a crowd of people in Times Square, killing one of them and injuring dozens more, has a history of drug, alcohol and psychiatric problems, law enforcement sources said. Marc Santia reports. Rojas is a former member of the armed services with a history of arrests for DWI, according to officials and law enforcement sources. He was dishonorably discharged from the Navy, where he once served aboard the USS Carney, for resisting arrest in Florida in 2014. Charges were dropped in the case. Harrison Ramos, a friend, told reporters that Rojas hadn't been the same since he returned from active duty in the Navy. He says Rojas was posting "crazy stuff" online that has since been taken down, according to The Associated Press. Other friends say he was having money troubles. Rojas was most recently arrested on a menacing charge last week for allegedly pulling a knife on an acquaintance in the Bronx. On Thursday evening, police were at an apartment where Rojas stayed with his mother in the Mount Eden section of the Bronx. Law enforcement sources said police are obtaining a search warrant and will soon begin looking for evidence that could help explain what led to the crash. 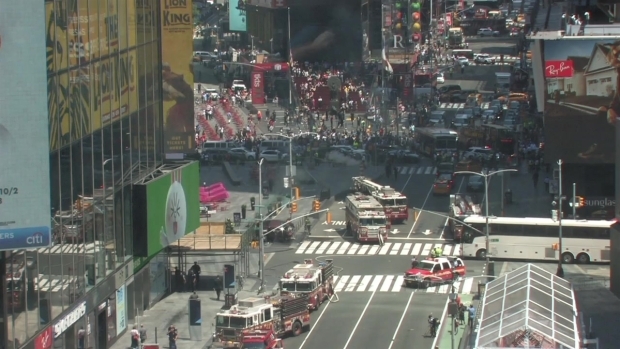 Video shows authorities responding to an incident involving a car in Times Square. Rojas' mother was also brought in for questioning; she said nothing to reporters as detectives led her to a waiting car. Fati Smith, a neighbor who has known the Rojas family for years, said she couldn't stop crying since she learned the news. She said she's in disbelief. Another neighbor said Rojas is a "good person" and he doesn't know what happened to him. Authorities stress the investigation is ongoing, but details are beginning to emerge about the man who incited horror and total panic in the Crossroads of the World. 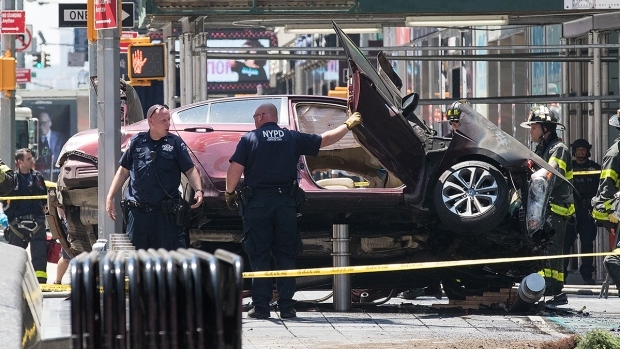 Witness Kristen Boyce saw the scenes unfold from the corner of 43rd Street and Seventh Avenue as civilians ran to the aid of people crushed when a car came barreling into Times Square, killing an 18-year-old woman.